Papayas may have their origins in Central America, but they've become a staple of U.S. grocery stores for a reason. The bright orange flesh of this fruit is not only sweet and refreshing, but according to "Whole Living" magazine, one papaya contains almost three days' worth of vitamin C. As long as you pick up a ripe papaya — look for one with reddish-orange skin — it's ready to eat and enjoy right away. The flesh of a papaya is juicy and sweet, so slices of raw papaya make for a satisfying snack. 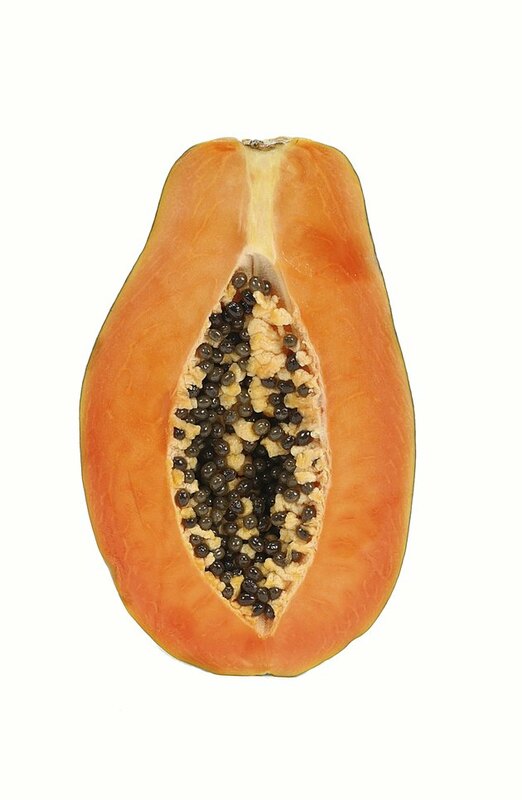 Use a vegetable peeler to remove the fruit's peel, then slice the papaya open and remove the seeds. Another option is to slice the whole papaya in half, spoon out the seeds and eat the fruit right out of the peel using a spoon. Eat the papaya plain, or sprinkle it with lemon, lime or orange juice; according to "Whole Living," acids such as those in citrus juices bring out the sweetness of the fruit. Slices or cubes of papaya instantly dress up a plain salad. Mix the pieces into a fruit salad of bananas, orange sections and berries, and toss everything with a dressing of light yogurt and lemon juice. Raw papaya slices also add sweetness to a green salad. Try adding them to a bowl of mixed greens, cucumbers, oranges and toasted almonds. The papaya's seeds are edible, so sprinkle then on top of the salad to add a peppery crunch. Papaya is a staple in a number of Asian dishes. Buy unripened papaya with green skin for these dishes; the flesh will be white and won't have as much flavor as a ripe papaya. Use a mortar and pestle to grind pieces of unripened papaya together with lime juice, sugar, garlic and tamarind juice, and stir the mixture into your favorite Vietnamese or Thai salad or soup. Ripe papaya also pairs well with the smoky flavors of Mexican foods. Try stirring small chunks of orange papaya into your favorite salsa or spooning them over a hot quesadilla. Skip the sugary cakes and pies and head straight to a papaya when you're craving dessert. Puree pieces in a food processor or mash them with a fork, and spoon the puree over frozen yogurt or a bowl full of berries, or make a parfait by layering papaya slices with lemon-flavored yogurt and slices of angel food cake. If you're at least 21 years of age, try your hand at making the Brazilian dessert known as papaya cream. Put a handful of papaya chunks and a scoop of vanilla ice cream in the blender. When the mixture is smooth, pour it into a bowl and drizzle a few tablespoons of creme de cassis, a liqueur made of black currants, over the top.